Over the years there have been many video tape formats used in domestic situations and these legacy formats are now getting older and less reliable, the machines that play them back are becoming harder to find and the repair of many of them is becoming almost impossible because of the lack of spare parts and qualified technicians. As new technology allows us to transfer these tapes to more reliable formats we find ourselves doing more and more of this work at DJM Digital. 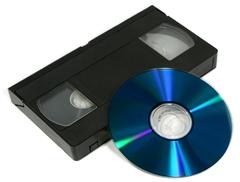 The are many tape based formats that are housed in plastic cases (cartridge style) of one size or another such as VHS and S-VHS are some of the common full sized tapes formats that we transfer. Camera tape formats include Video 8, 8mm, Digital 8, VHS C, and Mini DV tape formats as now transferred on a regular basis. DJM Digital has a number of video tape machines to cater for the wide variety of video tape formats available and can usually help you with your treasured video content. The benefit of transferring to DVD is that once a master has been created then multiple copies can be produced very quickly and at very competitive prices. We see many damaged tapes in our day to day transfer work and often have to deal with people's precious video tape memories that have been damaged by poor storage conditions, heat, mold, or water. Interestingly when stored correctly Video can be water tight - the layers of tape are actually closer together than a molecule of water, so apart from the outer layers which may be damaged (often irretrievably) we can quite frequently retrieve a vast amount of information from the tape. Often we have to replace the video housing with a new one, replace the tape hubs, clean the outer layers of tape and then run the tape to check it will play OK. We can then transfer the video content to DVD. If you have problems retrieving your video content from damaged tapes, before throwing them away as irretrievable, consider sending them to us for assessment. In some cases this process maybe covered by your home and contents insurance.